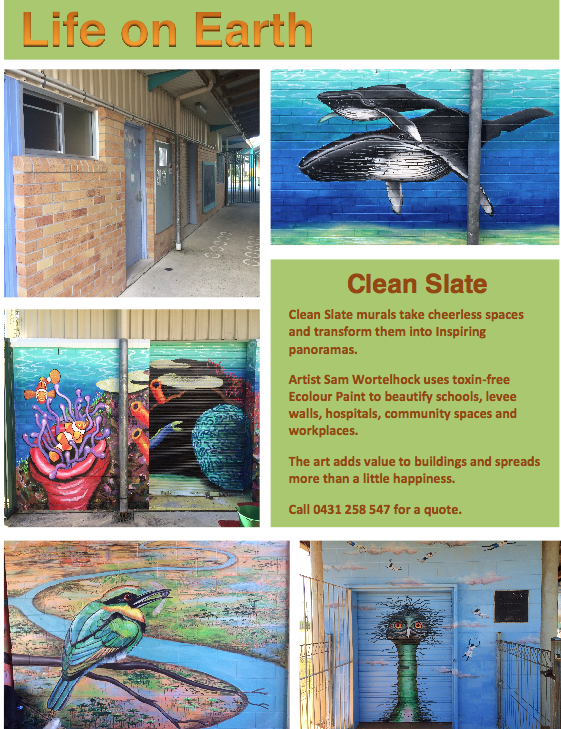 Sam from Break Away art recently painted the mural at the Ocean Shores School in the Northern Rivers. This is what Sam had to say about ecolour paint. “My company, BreakAway Art Pty Ltd takes creative programs into schools, remote communities and businesses, often working with children and disadvantaged people. I use murals for the purposes of visual storytelling. I work with ecolour paints to keep participants and myself safe. I am used to working with fine art oils and acrylics on my small scale works and I adore working with ecolour’s paints on these public art epics. The colours shine, the quality of the paint is perfect and dealing with the company has been a pleasure. They deliver on time, without fail and ask about the job so I am covered in terms of undercoat requirements and quantities. They understand my needs and care about the results. Here are the photos of the mural painted with ecolour paint.